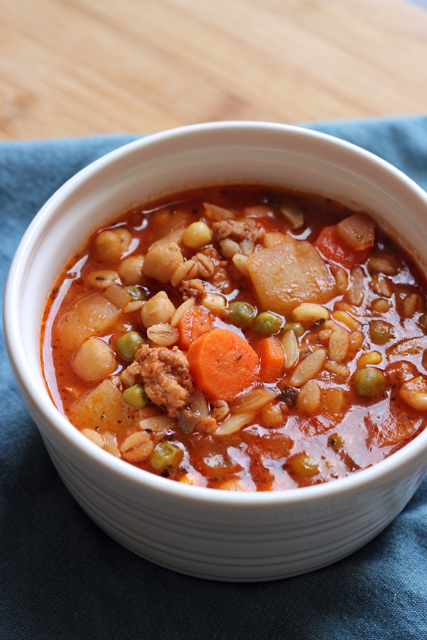 Mix up a pot of this quick and easy minestrone from simple kitchen staples. It’s the perfect answer to a cold and blustery day. During the Pantry Challenge, dinner was often soup, for many reasons. Soup is quick and easy to prepare; it’s a cozy, cold weather meal that can feed a crowd. Most importantly, soup can be made from almost anything, making it the perfect dish to use up odds and ends you find lurking. Since my odds and ends were all of a similar variety, we had this soup, this Pantry Challenge Minestrone, several times during the challenge. My kids and husband love it, so it makes for a super win for supper. 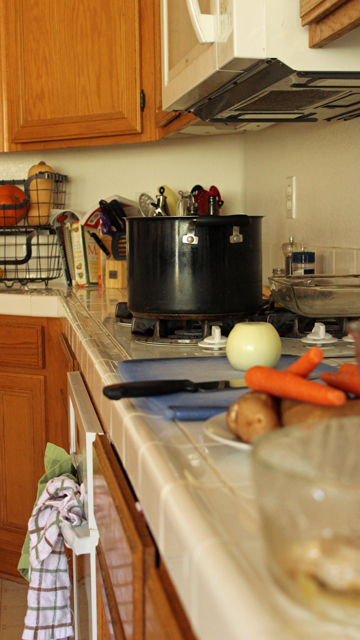 If you’ve already got leftover cooked vegetables or meat on hand, just toss them in the pot. Feel free to vary the vegetables or meat or even go meatless. Soup is a very forgiving dish. Heat the olive oil in a large pot over medium heat. Add the onions, carrots, potatoes, mushrooms, and garlic and cook until the onions go clear and the mushrooms are tender, about 7 to 10 minutes. Stir in the water and tomato paste. Bring to a simmer. Add the beans, pasta, barley, corn, peas, sausage, herbs, and salt. Simmer for 20 minutes or until the pasta and barley are tender. Dust with cayenne pepper, adjust seasonings, and serve. Jessica, are you posting a log of your whole30 meals anywhere? I am having a hard time sticking with it because I am struggling with morning sickness, but I would love a daily dose of inspiration. Congratulations on the baby! I would give yourself much grace while pregnant. If you don’t mind my asking, why did you decide to do it now? Have you considered some modifications? Like no sugar, alcohol, or soy? That would still be super healthy but not so hard.